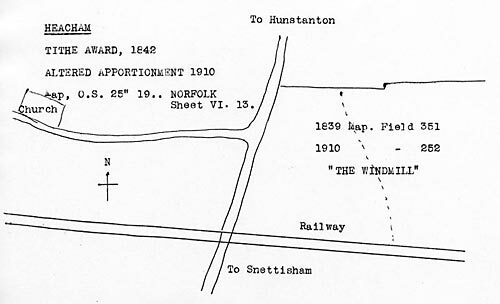 Heacham postmill stood to the northeast of the village and not far from Heacham watermill. Anyway, James appears in the 1841 census as a baker in Heacham. In the 1851 census, he's listed as a baker and flour dealer, employing 2 men and an errand boy, also in Heacham. By 1861, he's employing 3 men and a boy. He is dead before the 1871 census, but his wife - Sarah - is recorded as a 'miller and baker', living at the Bakers Shop in Heacham. It would seem that the 'Mrs Wagg' appearing in your entry is Sarah Wagg, the widow of James. I am researching the history of the house in which I live. James Wagg lived here during his life time with Sarah, the last of his three wives. His father was probably William Wagg a baker in Heacham. William was born in Sedgeford but moved to Heacham between 1797 and 1800, a period when James was born and hence the birth place confusion. There is no record of his birth in either of the parish records. There is a record of James Wagg as a witness at the marriage of Elizabeth Wagg daughter of William Wagg to Jacob Skoyles in 1823. One other witness was Rosemary Wagg her younger sister. Elizabeth Wagg, widow of William, married William Morgan (baker) one year after William's death in 1812. James would have been 14 or 15 years old. William Morgan died in 1823. James had one step brother Robert in 1818. I think this would have been an interesting time in the Wagg household. James Wagg had an entry as a baker in Pigot & Co for 1930.